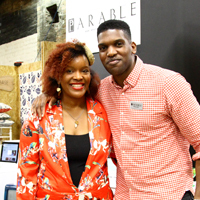 At the Makegood Festival for creative start-ups, I had the great pleasure of meeting Teanne and Anthony Andrews of ‘We Are Parable’. Not only were they great fun to be around and full of infectious enthusiasm, they also use Sage One Accounts to manage their finances! 1. Hi Teanne / Anthony, could you please give me a brief summary of who you are, what you do and the name of your business? We run an events company called We Are Parable and turn customers into fans by creating innovative, experiential events that get people talking about brands, in order to increase awareness and credibility. We’re a husband and wife team who have a combined 20 years experience in marketing and events, respectively. At the moment it’s just the two of us, but we’ve been approached by some people asking if they can be our interns, which is very flattering and lets us know we’re doing the right things! We’ve been using Sage One Accounts since the beginning of the new financial tax year. We were using spreadsheets before which was extremely complicated and difficult to do anything like generate invoices. As we are a growing business, it is essential that we had a system in place that reflected that. We love the efficiency and the simplicity of Sage One. We’re really new to this side of the business, so it’s great that it is so easy to use. We also are really keen on the fact that there is free one-to-one, 24hr telephone and email support if needed. It’s definitely made a huge difference to our company already. Self-belief and perseverance are two of the most important characteristics you need to start a business. There will always be someone to tell you that your business idea won’t work, but if you research your market and identify a gap or an opportunity, then go for it! The worst thing would be to open a paper a few years from now and see that someone has succeeded with an idea you had before. Also, find people whose skills compliment yours. That way, you can bounce ideas off each other and move faster in your business as a result. The awesome video below also shows the 25th anniversary film screening of Spike Lee’s ‘Do The Right Thing’ and old school block party they helped promote on 21st June 2014.